Rocking back and forth, the 26-year old mother sat nursing her infant before bed. Breastfeeding was an experience she enjoyed, a quiet time to strengthen the bond with her daughter. With a husband away in Afghanistan and two little kids to take care of, Jennifer Donald had her hands full. She cherished the time to sit and rock and hold baby. But one night was different. Jennifer found a lump in her left breast as she took a shower, and instantly began to worry. As she tucked her 22-month-old daughter into bed that night, she remembers looking into the mirror. Time stood still. “Holding my daughter and looking in my mirror, I remember thinking what if, what if it IS cancer,” says Donald. She was consumed with anxiety. With no family history of breast cancer she rationalized and made every excuse why it wouldn’t be breast cancer. She decided to mention the lump to her fellow nurses at her work at a Scott & White Ob/Gyn department. They told her she should do something about it, and so she got an appointment with her family doctor outside the Scott & White system. The doctor said she was too young to get breast cancer and failed to perform the needed tests to find the cancer. Thankfully, Jennifer went back and demanded the test. Three months after finding the lump that fateful day in the shower, she was diagnosed with breast cancer. Jennifer came home, curled up in a ball and cried. She doesn’t remember doing much else. Thankfully, the Army allowed her husband to come home and was there to comfort her, along with her supportive parents who took care of her small children. After hearing her diagnosis and after a long night of grief, the next morning Jennifer was in for surgery. They were able to perform the mastectomy to remove the cancer and then she moved to Scott & White for further treatment under oncologist Dr. Mohit Bansal. Jennifer found great comfort in Carol Edwards, the nurse who acted as her personal breast cancer navigator. Jennifer was a rare case, because she was so young. She consulted with her doctor and the tumor board of specialists who discussed her case. 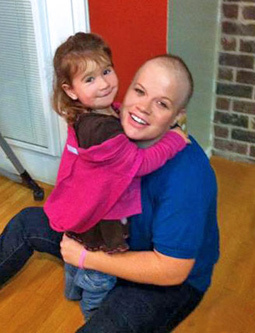 She decided she wanted to start chemotherapy before the mastectomy to remove her right breast. After completing six rounds of grueling treatment, losing her hair, and surviving complications with a fever, she had a mastectomy of her right breast to prevent future spreading of the cancer. “They all took really good care of me, and everyone interacted so well from the oncologist, to the surgeons, to the nurses,” says Jennifer. A few months later she began radiation at the Killeen Cancer Center, every day for six weeks while she waited for a hysterectomy. Jennifer’s breast cancer fed off of her hormones, so this step was a way to prevent the cancer from coming back. Dr. Paul West performed this procedure for her, the same Ob/Gyn doctor who delivered her sweet daughter just years before. During her recovery the Donalds moved to Harker Heights, and Jennifer knew she wanted to stick with Scott & White for her care. Dr. Ashwini Bhat took over as her primary oncologist in Temple while the team worked to keep Jennifer cancer-free. It wasn’t until Donald met with Dr. Raman Mahabir that she began feeling herself again. She opted for reconstructive surgery to restore her breasts, and help her feel more feminine. “I lost my hair, my breasts, my ovaries, and a lot of features that made me feel like a woman,” says Jennifer. As she began the reconstruction, Jennifer began accepting herself. She was grateful for Dr. Mahabir and his cosmetic surgery staff who helped her feel comfortable and took great pride in their work. Jennifer says she still sees the friendly smiles at Scott & White when she comes in for routine checkups and monitoring. She’s learned the importance of life and no longer sweats the small stuff. She is spending more time with her kids and less time worrying about her house. She’s learned to relax a little, and sympathize more with her patients at her work as a nurse.